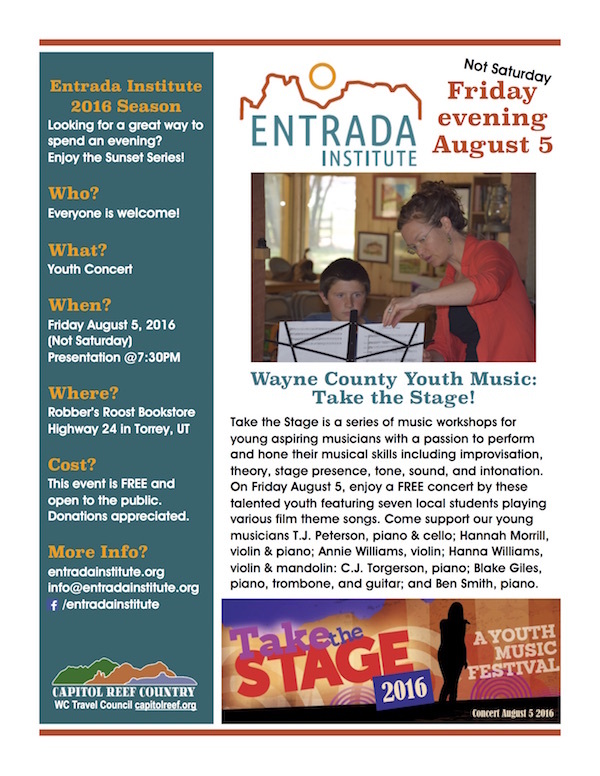 The Entrada Institute is excited to announce Take the Stage: A Youth Music Program. 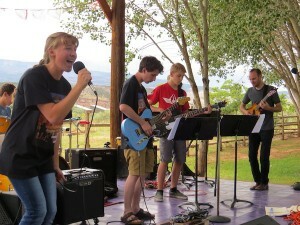 Held the weekend before the Women’s Redrock Music Festival in early August, the festival focuses on youth performers. “Take the Stage” is a youth music event for boys and girls ages 18 and younger. The event includes both workshops for youth and concerts for all ages. Take the Stage was built with the objective of bringing talented young musicians, music-lovers, and community together for the long-lasting interests of music and community. Using the same majestic backdrop and venue as the Women’s Redrock Music Festival, Take the Stage will be held at Robber’s Roost (an outdoor venue). Samba Fogo is a Salt Lake City-based arts and education organization that will be leading the workshops with hands-on curriculum and research-based teaching practices that address diverse learning styles and nurture creativity. 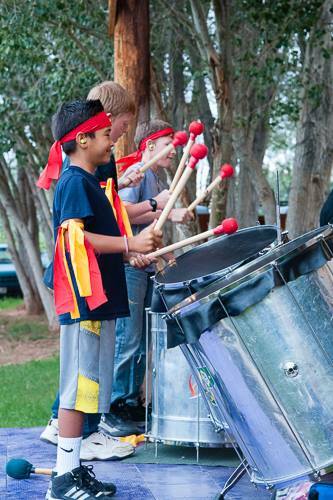 Youth, ages 12-18, are invited to participate in Brazilian drumming, dance, and song. In addition, participants will learn about Brazilian history and culture, broadening their global perspective. Drums will be provided for each participant during the workshops and performance, in which several ensemble drumming pieces will be performed. A variety of drumming techniques and rhythms will be introduced. Although both drumming and dancing will be presented, participants may choose to focus on one or the other. Who: Youth Ages 12-18, *Please inquire if participant is younger than 12 years of age. When: Friday & Saturday, August 3rd & 4th, 2018. Workshops are from 9am-1pm Friday & Saturday, culminating in a performance on Saturday at 7:30pm. Where: Workshops & Performance to be held at the Entrada Institute, 70 South 200 West, Torrey, UT. Why: An understanding of rhythm is beneficial to one’s musical education. Participants develop personal, social, and intellectual skills while they learn to work and “play” together in an ensemble. For information, contact Lynsey Shelar, project coordinator. To participate in the 2016 workshops and concert, go to the Call for Participation. 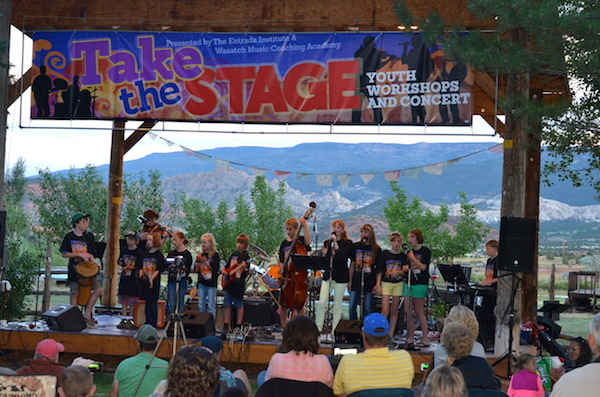 The second annual “Take the Stage” Youth Music Workshops and Concert was held on Friday July 31 and Saturday August 1, 2015. To learn more, go to https://www.facebook.com/takethestageutah. To learn more about this exciting festival, LIKE the Facebook page.